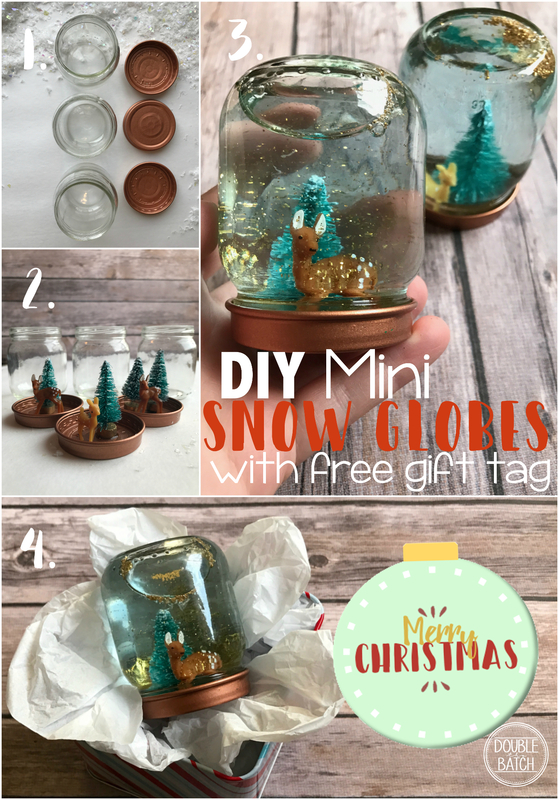 These DIY mini snow globes are perfect for when you need multiple affordable gifts to handout or accompany a Christmas gift basket. Easily create a stunning handmade gift all ages will enjoy! In the weeks leading up to Christmas I always have big plans to put together packages for far away relatives or friends I’ve grown a little distant to. Almost always, money and time get the best of me and one thing leads to another and all I send out is our family Christmas card. I decided there had to be a gift I could make that would be feasible even when time and money are tight. 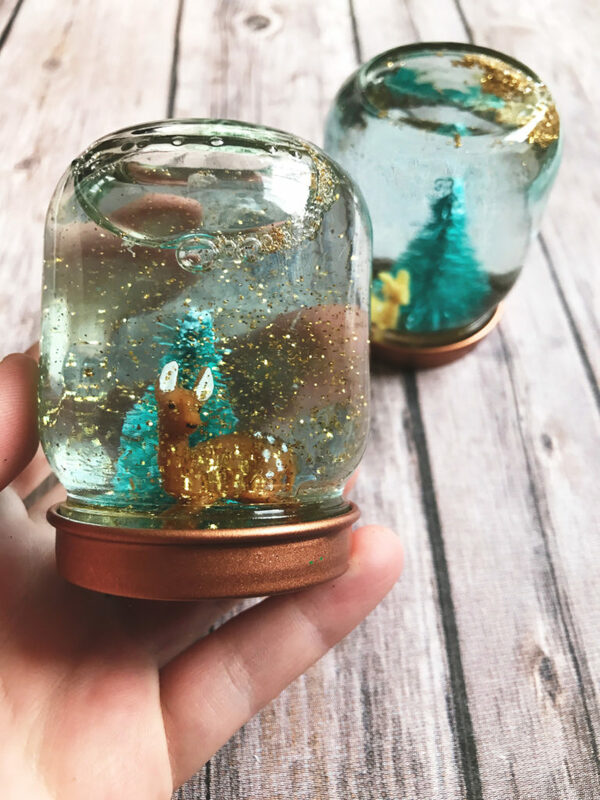 These snow globes are a timeless gift, enjoyed by all ages, can be easily made under an hour, and cost a little more then $2 each. I purchased my mini figures, liquid glycerin, and copper spray paint at Micheal’s. You can buy similar deer figures here, as well as liquid glycerin here, and paint here. The first step is to ensure all your jars are clean and dry. Next, paint the outside and inside of each jar lid. Once paint has dried, super glue your figurines onto the lid. 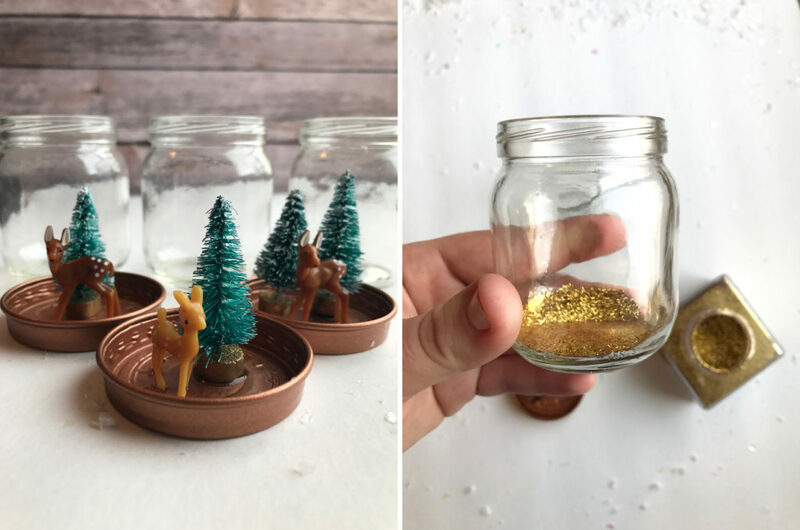 Fill each jar with a large pinch of glitter, pour about a teaspoon of glycerin, fill with water, and stir. Make sure water is filled completely to the top. Add superglue to the inside of the lid and slowly lower it onto the jar and seal. Shake and enjoy! One tip: I would highly suggest testing out your snow globe before super gluing it. I found this helped me decide exactly how much glitter I wanted or if more glycerin was needed. Also, if you are trying to ensure no air bubbles are left, don’t bother! I found it impossible to completely keep them from happening. I also found that the bubble actually helps when shaking anyways so it all works out for the best! 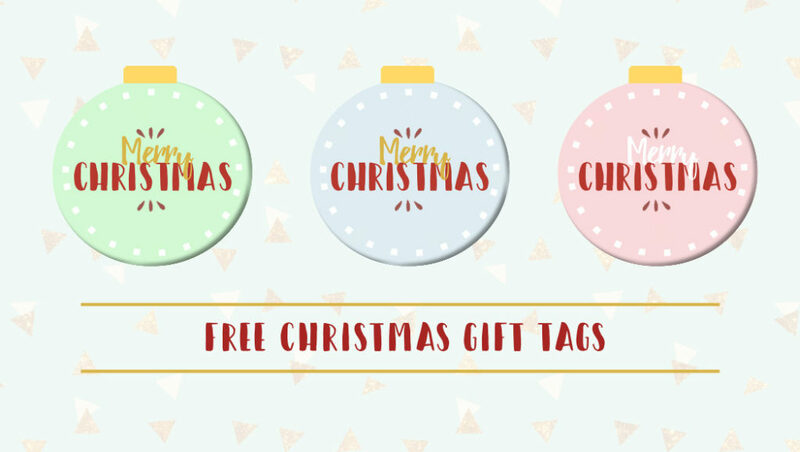 Finally, make sure you print off your free gift tags to accompany your cute mini snow globes. Click on the download link below, print on card stock, and cut them out. I absolutely love how my snow globes turned out and am looking forward to sending them out this year along with my Christmas cards. Hope you enjoy!